Post Office Monthly Income Scheme (POMIS) is safe and secure investment avenue that guarantee you fixed monthly income. You can subscribe to this scheme at any post office in India. The lock in period for investment under this scheme is 5 year. Monthly Income Scheme (MIS) is a low risk investment scheme and generate a fixed income for you. Account can be opened in single name or jointly also. POMIS is best for investors, looking for steady income and are reluctant to invest in equity instruments. 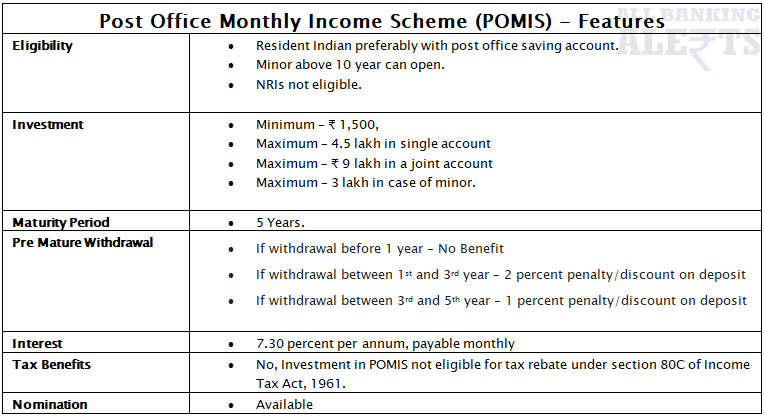 Here in this article, we will study about key features of Post Office Monthly Income Scheme (POMIS). Any Indian Resident Individual can open POMIS account. NRIs are not eligible to open POMIS account. Investment made under Post Office Monthly Income scheme earn interest rate 7.30 (for 01/01/2019 to 31/03/2019) percent per annum, payable monthly. For example, if Mr. Deepak has invested ₹ 4,50,000/- in POMIS for 5 Years. His monthly income will be ₹ 2,740/- for that period. After maturity, he can en-cash his 4.5 lakhs from the account. Download Post Office MIS Application Form here or Get it from post office. Also get signature of witness on form in case of nomination. Submit the form along with Xerox copy of Photo ID , Residential Proof and 2 passport size photographs. Make the initial deposit via cash/cheque. In case of payment by cheque, date of realization of Cheque in the Government Account will be the date of opening of account. Risk Free – As the name suggest, this scheme is fixed monthly scheme. The fund invested under this scheme is free from market risk and you get guaranteed return. Safety – The scheme is Govt. of India backed scheme so money invested under this scheme is safe. Guaranteed Return – Post Office Monthly Income Scheme (POMIS) offer guaranteed monthly income at an annual interest rate 7.30 percent,payable monthly. No TDS – TDS is not applicable on investment under POMIS. Tax Rebate – Investment made in POMIS account is not eligible for tax rebates under section 80C of Income Tax Act, 1961. Nomination – Nomination facility is also available. Customer can choose the nominee while opening account or during the investment term. Minor – You can also invest on behalf of the minor whose age is 10 years and above. They can avail the fund when they become major. However, investment limit for minor is ₹ 3,00,000/-. Joint Account – Joint Account can also be opened by 2 or 3 adults. However, each account holder will have equal share, regardless of who is contributing. Single Account can also be converted into Joint Account. Multiple Account – Multiple accounts can be opened in any post office subject to maximum investment limit by adding balance in all accounts. Transfer of Account – Account can be transferred also from one post office to another. Reinvestment Option – Amount you get after maturity can also be reinvested in POMIS. Bonus – Currently, there is no bonus paid on maturity on the scheme. However, there was 5 percent bonus paid on investment made between 08/12/2007 to 30/11/2011. Payout – Interest Proceeds are auto credited in investor’s post office saving account on monthly basis by ECS/CBS. Investor can allow the interest proceeds to accumulate also but that fund do not earn any interest. 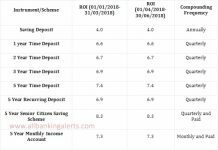 Recurring Deposit – It is a new feature which allow you to associate the POMIS account with RD account. Interest proceeds are invested into recurring deposit on monthly basis.